Inspection afterwards revealed that the “oily water” overboard pipe was seriously corroded from the inside and wasted/holed in places, see figure above. 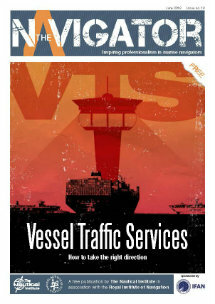 The pipe was subject to a temporary repair, as vessel was scheduled for repair yard after discharging. 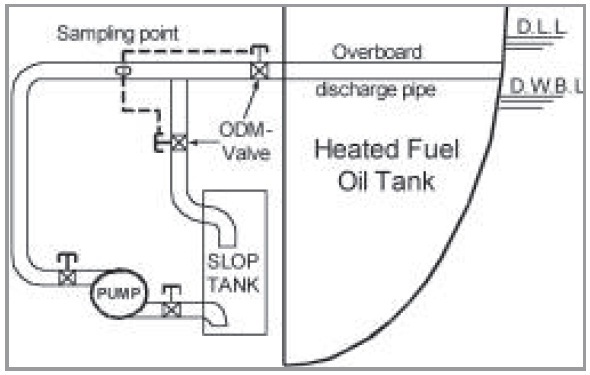 The “oily water” overboard pipe located above the deepest waterline, see figure below, passes through the port heated fuel oil tank. Oil from this tank had escaped to the sea through holes in the heavily corroded and wasted overboard discharge pipe. Figure above: Principle sketch of “oily water” overboard arrangement for ships built when this arrangement was still acceptable (before 1 January 1999). “Oily water”/ballast overboard discharge piping passing through heated fuel oil tanks have a potential for causing oil pollution. For all old oil tankers with arrangement as described in this incident, the owner should be aware of the possibility of pollution into the sea, where serious internal corrosion of the pipe(s) exists. The internal condition of such pipes should therefore be subjected to follow up at regular intervals, and be included in the maintenance system on board.